What is the Definition of Dollar Cost Averaging? In these turbulent times, many people are looking to avoid the high-variance swings of the stock market. Some people are currently sitting on cash and are slowly looking to ease their way back into the markets. They are hesitant though, as the prospects of their investments dropping an immediate 20-30% doesn't sit particularly well with them. Many of these people have been advised by their brokers to utilize "dollar cost averaging" in an effort to minimize the volatility in their accounts. What exactly is "dollar cost averaging"? Let's say that you have $100k to invest, and you have decided that you wish to purchase $10k worth of 10 different companies. The markets are up big one day and then down big the next, and this has you feeling extremely hesitant and afraid to pull the trigger. What if I buy, you think to yourself, and the markets plummet 20% over the next month due to further economic instability? My $100k investment will suddenly be worth $80k. "Dollar cost averaging" means that instead of investing the entire amount at once, you would be buying a fixed dollar amount of shares at regular intervals. You decide to buy $10,000 worth of Google. Instead of simply purchasing $10,000 worth of the shares at $292.09 today, you decide that you will invest $1,000 in Google shares every month for 10 months. After ten months, you will have invested $10,000 into Google. 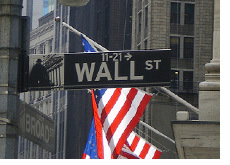 You may have bought $1,000 worth of shares at $292.09, $1,000 worth of shares at $275.00, etc. This all depends on the price movement of Google during those ten months. You could either end up with a lower average price on Google using the "dollar cost averaging" strategy, or a higher price, depending on the performance of Google during that time. 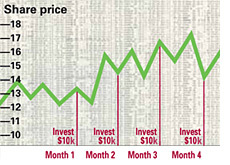 One thing that you need to be careful of with "dollar cost averaging" is the commissions that you will be paying. If you are at a full-service broker, you could find yourself paying a small fortune in commission fees. Think about it - if your broker has a minimum commission fee of $29.95 for every trade, you could end up paying $300 in commissions to enter into one position! I would recommend a broker like Interactive Brokers which has an extremely low per-share commission structure. If your full-service broker is advocating a "dollar cost averaging" strategy, then you had better figure out just how much in commission you will end up paying. Another thing I would recommend is - if you choose to utilize "dollar cost averaging", make sure to keep on top of the developments at the companies that you are investing in. You may find that after four months, you no longer are comfortable investing in the company due to a late-breaking development. There is nothing wrong with abandoning your buying program and selling the stock at that point. Too much people just blindly average themselves into a position and ignore any recent developments at the company. I know people who were dollar cost averaging into AIG right into oblivion. I don't use dollar cost averaging myself, but many people will swear by it. You need to do what you are comfortable with - after all, it's your money.